Fire damage cleanup and filing an insurance claim are areas not many homeowners know much about. Fortunately, our team at TRAC Solutions in Chippewa Falls can help you through each of these processes! Here are a few important things for you to know about working with your insurance company for filing insurance claims. This is an important first step that can save you time in the future working with your insurance company. You should simply just take a few moments to reread your policy and make sure that the specific damage done to your home is covered in your policy. The more evidence you have to back up your water damage claim that better. It is better to go overboard and gather too much evidence than to not gather enough. This evidence should include pictures before the damage and pictures after the damage, a detailed inventory of your possessions, and documentation of the involvement of others in the cleanup process. One of the things you should do very soon after a flood is to contact your insurance company. Working with insurance companies can be a frustrating and time-consuming process so many people tend to procrastinate making that first call. Don’t do this! Although the process may seem intimidating at first it is important to involve your insurance company throughout the entire process. While it is important that you don’t begin making major repair efforts to your home after a fire before they are approved by your insurance company, you should do what you can to prevent additional damage and salvage as many of your belongings as possible. These actions will be considered as emergency repairs and won’t affect the insurance claim process. Also, the insurance company won’t be responsible for additional damage after the initial claim. So, you are advised to remove standing water, take water-saturated materials to a well-ventilated area to dry, board up any broken doors or windows, tarp holes in the roof, and take any other necessary measures to prevent further damage. You should prepare a written notice for your insurance company (an insurance claim) as soon as you have gone over your insurance policy and gathered all the necessary information. This information includes things such as the date of the incident, the location of the damage, a complete list of damaged items, receipts for initial cleanup, and restoration estimates. Keep in mind that it may take up to fifteen days after you have submitted your claim for an insurance adjuster to come to your property. Furthermore, the longer it takes you to come to an agreement with your insurance company the slower and more difficult the restoration and cleanup process will be. A fire is the last thing any homeowner ever wants to have to deal with. 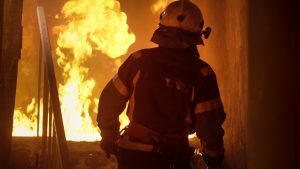 On top of the trauma of the fire itself, the restoration process and dealing with your insurance claim can be difficult. Fortunately, our team of restoration experts at TRAC Solutions in the Chippewa Falls area will be by your side throughout the restoration process and in any dealings with your insurance company.